Several years ago, I dedicated a partially dead mesquite tree as a natural trellis for a native climbing milk-weed (Funastrum cynanchoides). The vine traveled up the trunk and reached the highest branches by the second spring. Lovely globes of pink-edged white blooms peppered the vine in summer. Flowers turned into dangling, short fleshy tear-drops, like green Christmas ornaments. The seed pods eventually split open, loosening their helicopter-like seed-transporting fluff. Luckily, winds blew seeds toward the resaca. Climbing milkweed leaves are important to monarch and queen caterpillars; however, one vine will feed plenty. Limiting this plant in your garden is wise unless you want the vines taking over — take care which way the wind blows. 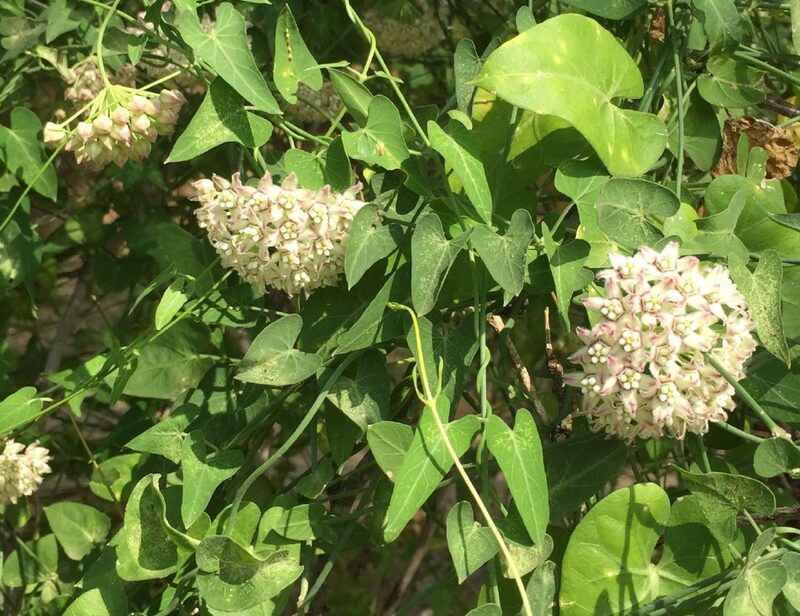 A native Berlandier trumpet (Acleisanthes obtusa) one year made its way to the base of the vine tree and quietly intertwined itself with the milkweed. 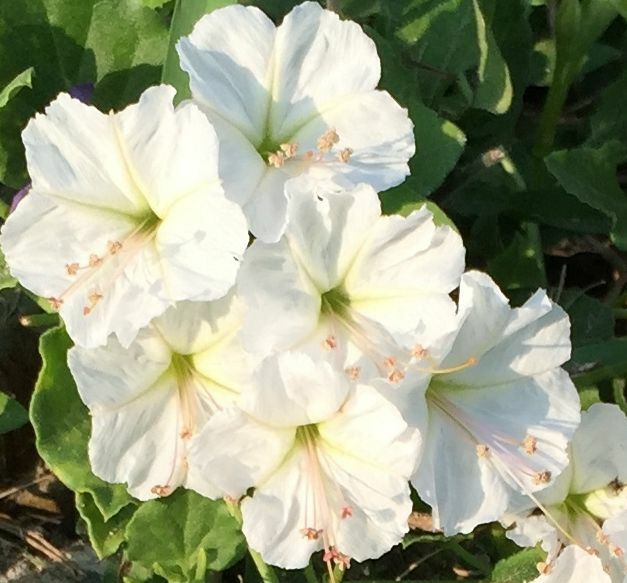 Berlandier trumpet, also called vine four o’clock, has clumps of small white trumpet-like blooms with pink filaments and anthers that make the petals look like they’re splashed with pink polka-dots. The flowers bloom through all seasons — at night — opening late afternoon and closing by morning — great targets for pollinating by night-flying moths. 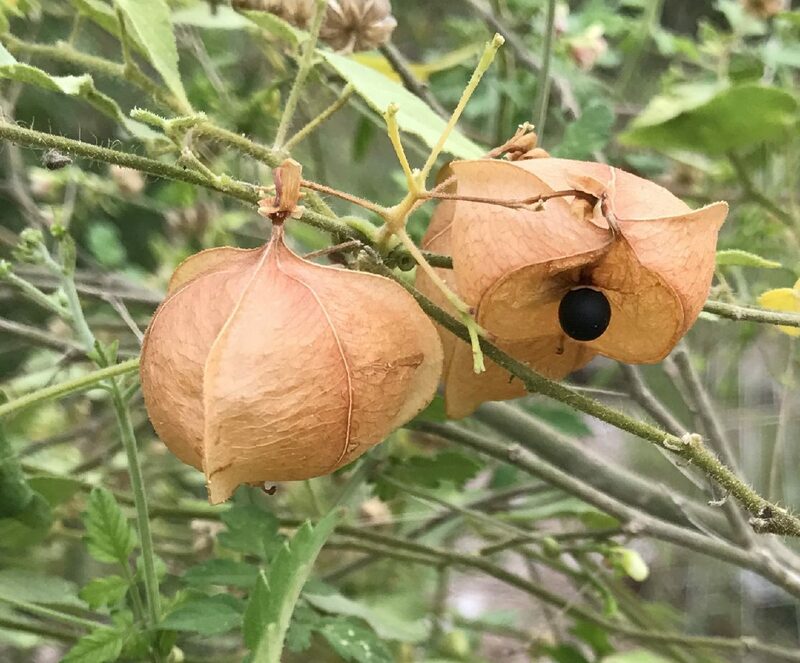 One of my favorite vines is common balloon vine (Cardiospermum halicacabum). It’s an introduced spe-cies, believed to be native to Puerto Rico and the U.S. Virgin Islands. It’s especially fun this time of year be-cause the balloons turn cinnamon-colored and look like fall-festive lanterns dangling in the garden. In the wild, this vine will wend its way over shrubs and other plants, but can be trained to a trellis in a garden. I planted common balloon vine to cover part of a chain-link fence. Tiny white flowers bloom during all sea-sons which provide nectar for winter-lingering butterflies. The fruit is tissue-paper-thin when dry. Each pod contains two or three round, one-eighth inch diameter black, white-tipped seeds. Many pods will be empty. If you look closely at the skin, you’ll find a hole where insects have entered to eat the tasty fare. Seeds that make it safely to the ground are excellent food for Bob-white quail. Anita Westervelt is a local Texas Master Naturalist.